The four Maasi tribeswomen are keen to talk. Sitting on the bare ground as red dust swirls around us, they tell how the drought across the East African country of Kenya has affected them. Twenty men from the 110-strong village of Elerai, on the Kenya-Tanzania border have taken their cattle and are droving them on foot across the country in search of grass. Last the village heard, the men were near the capital of Nairobi. “They’ve been gone two months now,” says Menteine Mparkepu, a senior woman in the village. They don’t know when the men will be back. If they stay on this dry, dusty land, the cattle will grow thinner and weaker, and even the renowned fighting skills of the Maasi won’t be able to protect them from predatory lions. Their story is a common one across Kenya, a country in the throes of severe drought as the long rains have failed to arrive for the past three years. Experts say the country stands to lose half its cattle and goat populations during the extended drought. The country’s main source of foreign currency is the export of agricultural goods – Kenya is the world’s biggest exporter of black tea and 75% of its population works in the agriculture sector, most as subsistence farmers. With inflation unofficially at 30%, the price of the staple food, maize, has doubled, and the next harvest’s yields expected to be nearly a third lower than normal, according to the UN’s World Food Programme. The programme, which supports almost one in 10 Kenyans through food aid packages, estimates that 31 percent of Kenya’s total population is undernourished. It is currently appealing for money to provide emergency food assistance to nearly 4 million Kenyans hit by the drought. Where there should be fields of tall, flourishing maize, the ground is bare save a few stunted stubs. Cattle, weakened from a lack of feed, lie dying on the roadside, unable to keep up with the herd. Wildlife workers in Tsavo East, Kenya’s largest national park, tell of the five elephants they have found in the past 14 days alone, dead from starvation, and rangers have resorted to hand feeding their wild hippopotamus populations to halt the animals’ deaths – an expensive activity with no end in sight. However, there are still small doses of good news: such as the safari camp near Elerai village establishing a community project to train the local Maasi population in tourism. 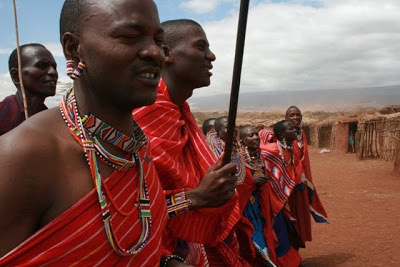 Currently, many young Maasi men are employed as security guards protecting the wildlife camps from wild animals – it’s a good job for those with little education, especially during times of drought when their cattle herds are in decline. The Satao Elerai camp aims to be completely run by the local population and is establishing a local school for the Maasi children. The nearest primary school is 1½ hours’ walk from the village. The women make beaded jewellery to sell to passing tourists to raise money for food and hope that their children will be able to receive an education. It’s a long-term view, but Kenyans must yet survive in the short term. Mombasssssa, Mombasa, baby. Where coconuts wash up on the shore and there are three different kinds of arrowroot on the breakfast buffet. The very name of this city conjures up white sand and tropical rhythms. It’s only when you leave the game parks and return to Kenya’s cities that you realise how poor this country is. Sandals made from used car tyres are standard, houses are cobbled together with timber, iron sheets, mudbrick with thatch roofs and occasionally a few sturdy homes made of local stone. 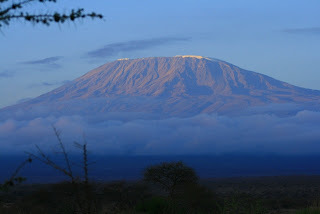 Our entire trip saw us coasting along the southernmost border of Kenya and Tanzania down from Nairobi to Mombasa. Driving from the last national park, Tsavo East to Mombasa on the south coast, we started to see coconut palms and mango trees, and the air distinctly more humid with a taste of salt. Mombasa is where much of Kenya’s Muslim population lives, influenced by the Arabian Gulf across the Indian Ocean. Traders from Oman have plied these waters with their dhows for centuries – brought in and out of the deep harbour by the trade winds that dictated their lives. Men wander around in dishdashas (the long white robes) wearing Omani-style embroidered caps and mosques, woman covering their heads with scarves and goat and camel meat are sold in the pungent open-air meat markets alongside massive hands of bananas and great tins full of colourful spices. It’s the second biggest port in Africa after Durban, and this afternoon, Mombasa was besieged by steamy rains. Most tourists use it as a launching pad over to Zanzibar, though savvy Kenyans said the north coast of Kenya has better beaches and better prices. Mombasa was the end of my Kenyan trip and the beginning of my journey home to Cairo, flying Mombasa-Nairobi-Khartoum-Cairo. I drank wine on the second leg and slept on the last, sprawled across three seats, only to be woken up by us hitting the tarmac! No ‘seats upright, belts on’ crap on Kenyan Air, Pride of Africa! No siree! The two large, jovial Kenyan women opposite laughed their heads as they watched me jerk bolt upright as the plane screeched to a stop: I’m pleased I could give something back to Kenya. 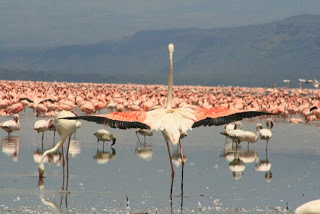 Poaching in one of Kenya’s premier national parks, Amboseli, is at 20-year highs, says the African Wildlife Foundation, which reported in April that 703kg of whole or partially chopped elephant tusks were confiscated from poachers in the park. That’s about 50 elephants worth of tusks. Apparently they’re reaching US$38/kg on the Chinese market. Wholesale price, of course. You can only guess at the tusks’ street value. So when we travelled from the excellent park into its neighbour, Tsavo West, we had an armed guard of cheerful young Kenyan boys wielding Russian-made rifles to guard from unscrupulous poachers who, on a quiet day, have been known to lift a few fat Western wallets, though my guide Mwasy stresses that the last time this happened was a very long time ago. Years, in fact. The night at Satoa Elerai camp was one of the highlights of my trip. The entire camp is just nine tents and four suites. The words ‘tents’ and ‘suites’ are so boring. 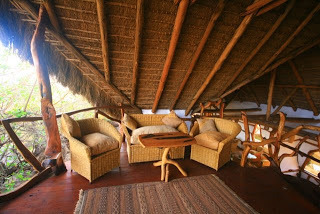 The suites are luxury cottages with thatched roofs, deep baths and enormous, romantic beds swathed in snow-white mosquito nets, and look out onto Amboseli National Park, renowned for its elephants. The tents are canvas affairs, but the massive beds look straight out onto Mt Kilimanjaro in neighbouring Tanzania, about 20km away, and the highest mountain in Africa. 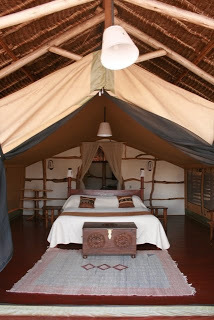 During an afternoon siesta in my tent in The Mara, I hear the cluck and warble of two little Maasi herdboys at play. Their cattle are grazing on the opposite side of the River Talek, tales swishing against the low vegetation. I know the two boys are sitting in a little grove opposite my tent. I can feel them observing me as I step outside. As they emerge from their hiding place, they cup their hands together and whistle a bird’s call to catch my eye, and wave – big, open-handed children’s waves –then follow the herd back into the scrub. I sit down to breakfast of coffee, fresh pineapple and hot pancakes. All the while, a Maasi guard in full regalia stands behind me, employed solely to chase away vervet monkeys, which eye my pineapple with avarice. The Maasi wears two thin red and white printed cloths called kangas, one tied around his shoulders, the other around his waist. Beaded bracelets are tied above his knees, his ears are pierced with a large hole maybe two inches long. Strings of necklaces are tied around his upper body and black rubber sandals – formerly car tyres – are on his feet. At his waist hangs a sheathed knife and he carries a long, straight stick which he shakes vigorously at the monkeys when they come too close. Before you jump on me with accusations of cultural imperialism, many young Maasi guys are employed at the lodges as security guards and runners – it’s good employment for those with little education, especially during times of drought when their cattle herds are in decline, and they are as curious about us foreigners as we are about them. Eventually the monkeys know they will not win against the hawk-eyed man behind me, and slink off to squabble, fight and flea each other in a nearby sprawling sycamore fig. 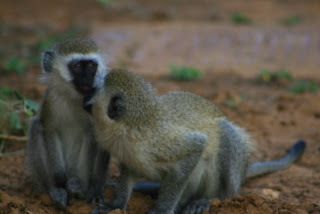 This is the daily work of a Masai Mara monkey and man. 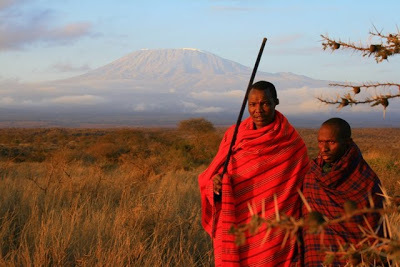 Moses is a young Maasi and like most of his tribe, which are said to number around 900,000 on both sides of the Tanzanian-Kenyan border – is most comfortable in traditional dress. He lives in a village 1½ hours’ walk from my lodge. When he was eight or 10, he can’t remember which, the outer ridge of his ears were sliced, but left intact on his head. They were then twisted around the remainder of the ear so that his ears are woven into two complex knots on the side of his head. I never thought I’d hear a man of the warrior Maasi tribes, who lions are said to fear, admit he cried. In bed: There’s an elephant on the other side of my tent. I can hear it ripping apart the foliage beside my bed. It would be three meters from where I’m lying, with nothing but a pen to defend me, which, I surely feel, is NOT mightier than the sword, in this instance. At first, I was unsure what the noise was, and went out to investigate, in nothing but my thin nightdress. I turned the light on and there he was – ears akimbo as he looked at me, and I at him. We both paused, I apologised for disturbing him, and went quietly back inside. He is a VERY noisy eater. …he is REALLY loud. Should I ‘pppsssssst’ at him to stop, like I do with the barking dog in my Cairo neighbour’s apartment? What if he gets offended and charges? The crack of breaking branches and torn leaves. “Enough, already!” I call out. Doesn’t he know it’s past 11pm? This elephant’s going to keep me awake all night. I wonder what he’ll think when my alarm goes off at six? This morning, I saw what I suspect was my night time tormenter. 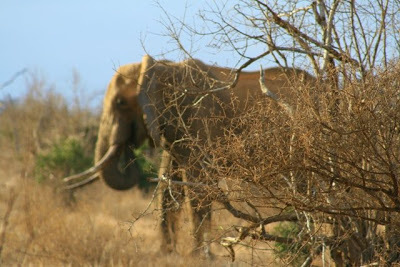 He is a bull elephant about 20 years old. Bobby, the long-term, Swiss-born manager of the Satoe Camp in Tsavo East natinal park, walks with me to say good morning. He speaks gently to the old man in Swahili. If the elephant survives the loss of blood and subsequent infections, he will need a friend for at least a year to help him while he learns how to live again without his hand, stepping on the grass or ripping with his tusks, instead of curling around it with his now nearly useless trunk. Then, after that year, he will most likely survive, Bobby explains. The camp faces a small waterhole which in just one morning I spotted a herd of elephant, zebra, baboons, giraffes, waterbuk and flurries of fat, defenceless guinea fowl. Impala trot amongst the 20 tents, babies in tow. They feel safe here and will graze the plains during the day, coming back to the security of the camp during the dark, dangerous nights. 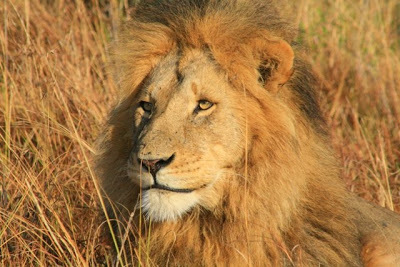 There was excitement when, before 7am, a lion was spotted by some guests, cruising the scene, but the guards are wise to his presence. Everything is at the waterhole even though it’s an unfashionable time to be drinking, now at lunchtime – despondent wildebeest drink morosely, zebras kick and frolic, baboons spit and argue, buffalo drink deeply and resignedly and even an impala skips between them, a scout for his bunch of bachelor boys, males who have been cast out of the herd to find their own ladies. 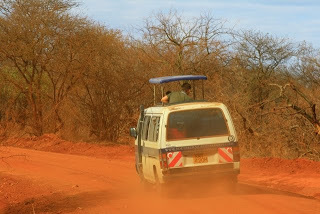 Tsavo West national park is stricken by drought, which is a naturally occurring phenomenon here every 10 to 15 years. But this year, it seems to be worse: perhaps because there are more tourists witnessing the effects – the decomposing bodies of starved hippos in the waterholes, the gaunt lone buffalo living from day to day in the hope lions won’t take them during the coming night, and the migration of the Maasi men, who are droving their cattle across the length and breadth of the country in search of green pastures. 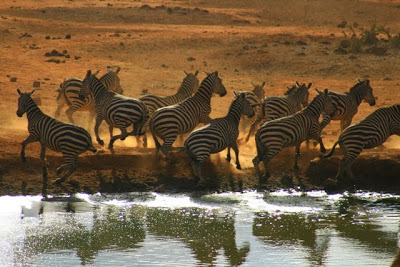 On the outskirts of Nairobi, I saw a band of Maasi patiently sitting outside the Nairobi National Park waiting for their confiscated cattle to be returned to them – they had turned their herd loose in the park for its grass, and rangers had arrested the cattle and were debating the course of action. In a Maasi village in southern Kenya, a group of women told me how 20 men from their village have been away for two months, droving their cattle. If they stay on this dry, dusty land, they will grow thinner and weaker, and even the ferocious skills of the Maasi won’t be able to protect them from lions. Meanwhile, in Tsavo East National Park, our camp’s staff describe how they have had five dead elephants in the past 14 days, starved of food. The lions are fat these days, feasting on Kenya’s misfortune. Tonight, from my balcony, I watched the carnival of the animals: deer of all sizes from the tiny dik dik to the walking meal that is the waterbuk, trotting elegantly to the water only to be frightened off by a bunch of savage, brawling baboons, running along the ground at breakneck speed, their angry growls sounding like cats fighting. The zebras moved in afterwards, swishing their tails and waiting patiently till the bad-mannered baboons had finished their aggressive antics. The striped animals lined up in rows, fighting for pole position, one contrary beast nipping and kicking those who stepped out of line. Two herds came through, then there was quiet while the sun set, and now the elephants have arrived. They are sloshing and snorting in the smaller waterhole, drinking deeply and flapping their ears happily all the while illuminated by a few lights that render them a ghostly pale orange. One, the large bull, makes his herd wait while he scratches his backside happily on a large rock. He is joined by a friend and the sound of their skin rasping against the rock echoes through the still night. They take a minute for some mild deforestation, then move off silently in the night. A giraffe is waiting in the wings, and dark shapes that I can’t identify have scuttled up nearby trees for a look-see. Who will be next at the waterhole? The sun is gone and the plains are alive. The crunching of rabbit bones is loud, even from 15 meters away, over the din of my chatty guide. The lion licks the bones, tears the meat and crunches merrily, all the while looked on by a dissatisfied lionesse. It’s the lion equivalent of turning on the footy half-way through the act. Finally, the lioness gives up and wanders off in disgust. The lion finishes his feast and heads over the river, where he meets another lion. We wait for a clash of the titans but the two merely sniff each other, recognise their brother, then team up to hunt the buffalo we’d passed earlier. They cruise slowly through the scrub, the wind in their favour. 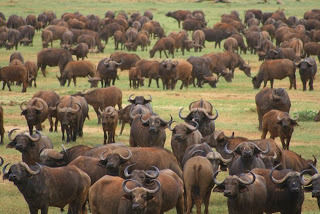 The buffalo don’t even know they’re there. But then they stop their monotonous chewing and look up. The three birds riding on their backs, little oxpeckers, tighten their grip as the largest male lifts his tail and lets loose a stream of poo. “Look! He’s getting ready! That’s stress defecation!” shrieks Julius, dancing in his seat. The male buffalo then leads his girlfriends into the scrub, directly in the lions’ path. The two lions see the angry buffalos and turn as one to saunter back the way they came. But the buffalo comes at them again, head lowered, and charges the big cats, who give up all pretense of looking cool and, with tails between their legs, break into a run. The primo buffalo shakes his head and snorts, the oxpeckers resume their grooming of their mount. They know the lion is not king of the plains, and have put their money on the right horse. Today was mega-Nairobi tourism, though interestingly enough, nothing I saw was actually in Nairobi. It was all on the fringes of the city of nearly four million, which includes the famed Kibera slum, home to up to a quarter of the city’s population. We drove straight from the airport to the district of Karen, named for Karen Blixen, the author of ‘Out of Africa’, a tale of 1930s life in Kenya, later made into a movie starring Meryl Streep and the delicious Robert Redford. Think Karen Country Club, Karen Shopping Mall, Karen Holiday Homes, and you’re on the right track to how valuable this Danish woman has been to Nairobi. Of course, I visited the Karen Blixen House, who, my driver deliciously informed me was a member of a wife-swapping club, lit a candle when she requested her disdained husband’s presence in her bed (instead, she opted for Robert Redford in the movie, smart girland died of syphilis. She was also a pioneer farmer of the Kenyan coffee industry, defender of African women and a crack shot, but these stirling traits are becoming overshadowed by her sexual proclivities. Also on the list today was the David Sheldrick Wildlife Trust where orphaned baby elephants are sent in from across the country to be healed from spear, gun and even arrow wounds, and the Kazuri ceramic bead factory, which gives single mothers a job and medical care while they hand make beads that are imported across the world. The crème of the day was the Giraffe Manor for breakfast. 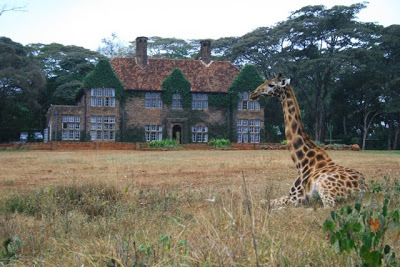 A 1930s manor reminiscent of the Glasgow designer Rennie McIntosh, the breakfast parlour opens up so the 10 or so giraffes can stick their heads in and say hi for breakfast. It’s an awesome sight, these topsy-turvy Daliesque animals cantering across the lawns. There have been a couple of leopard attacks (“We all check our little dogs every morning,” confided manager Helle) with one of the young giraffes being severely bitten, a travesty in not only humanitarian but also financial terms. These are valuable animals, she adds, and with only 400 giraffes in Kenya, they are on the critical endangered list until their population reaches 1000. At this sanctuary, four babies were born this year, but two have already died and leopards bit the third. The big question about Nairobi is: is it safe? The UN worker and the Egyptian businessman in the queue with me at Cairo airport both said no. Use only a hard bag for luggage or the luggage handlers will slit your bag and steal everything. Don’t walk alone at day or night. Give up your bag or car if asked – they shoot first and ask questions later. Trust no-one in Africa.